Since the computer I am using doesn’t have a serial port (most of the computer these days don’t have one) so a USB UART (Universal Asynchronous Receiver-Transmitter) adapter (purchased here) is used which enable us to send serial data to a computer via a USB. 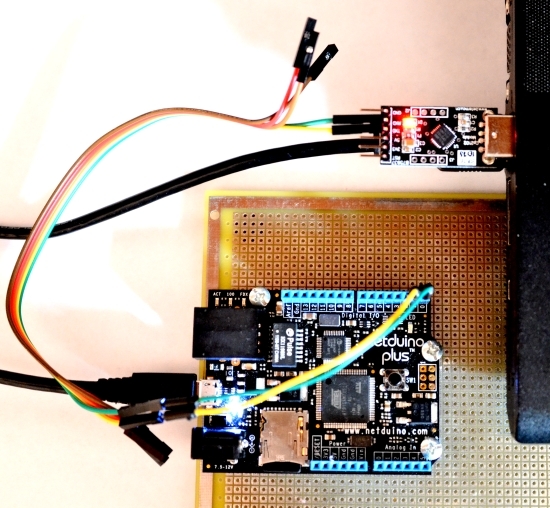 Netduino natively supports UART RX and TX on pins digital 0 and 1 pins. 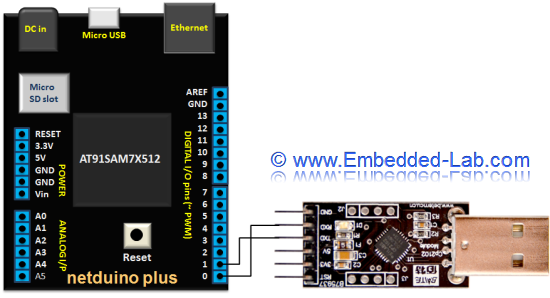 So, the pin 0 of Netduino goes to RXD and pin 1 is connected to TXD of the USB-UART device. 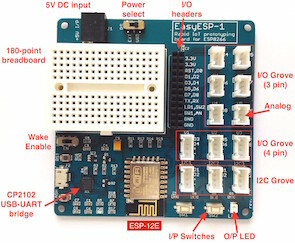 When the information is sent from Netduino to USB UART device, we need a computer application to harness that information from the COM port. In order to receive such information I wrote a COM Talk tool. Let’s create an application that can receive information from COM ports. I also added some functionality so that it can send information via selected COM port, however, we will not discuss on that part. I will not go into the details about how this tools works as it is more .NET stuff (than programming on microcontroller). This application can be used to receive information on any COM port so it’s not limited to this tutorial. This is how the UI of this tool looks like. The Input section of COM Talk will show the information received in selected COM port. Internally, bytes received are converted to string and displayed. 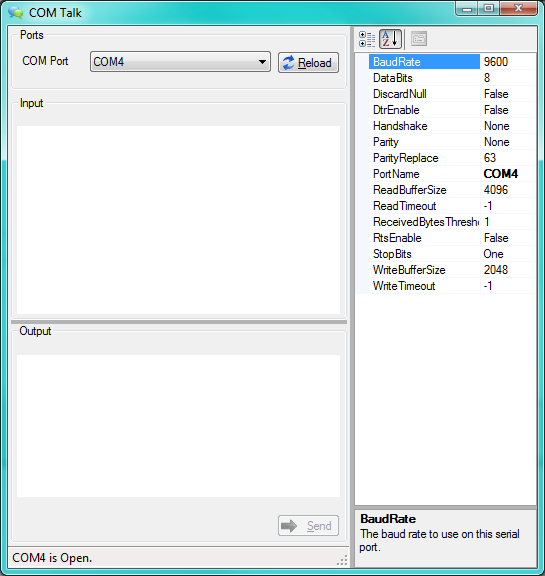 The Output section allows sending information to COM port. This section is not used in the tutorial. We need to have this tool running whenever we want to receive data on a COM port. Here’s the entire code related to this COM Talk. Let’s change the gear and learn how we can send information to a COM port from a Netduino. As mentioned earlier, Netduino has some dedicated Digital I/O for serial communication and we are going to use digital port 0 and port 1 of Netduino. The code is written in such a way that it will only send the text file information when the on board button is pressed. To facilitate the information transmission via a serial port there are Reader and SDCard classes created. The Reader class basically uses StreamReader and calls its ReadToEnd method. We don’t actually need an SDCard class however I am making one as we can easily add more and more functionality to this class. This class basically comprises two public properties. Now, we have these two helper classes defined; let’s look at our main program. In the Main method, we have created some instances of OutputPort, SerialPort, InterupPort, and subscribed to NativeEventHandler for OnInterrup event of on board button, and also to DataReceived event of SerialPort class. We then open up the serial port and let the main thread to sleep forever. if (data2 == 0) // button pressed? The second argument in above code, data2, contains the state of the button. The value of data2 becomes 0 when the button is pressed. So, at this state (data2 equals to 0) we need to read the text file and then send the information to a serial port. As it can be seen, the routine first calls ReadDataFromFile function by passing the path of the file to read to get the text file content. In the ReadDataFromFile function, it first creates an instance of an SDCard class then creates another instance of Reader class, only when SD card is readable. The Read method of reader class return the text of the given text file path. Now, in the button_OnInterrupt method, we can see, it then calls SendDataUsingCOMPort and passes the corresponding bytes of the text that was read from SD card. In the SendDataUsingCOMPort we simply call the Write method of the serial port. Using the SerialPort class we were able to send the data to COM1 of Netduino by calling Write method. 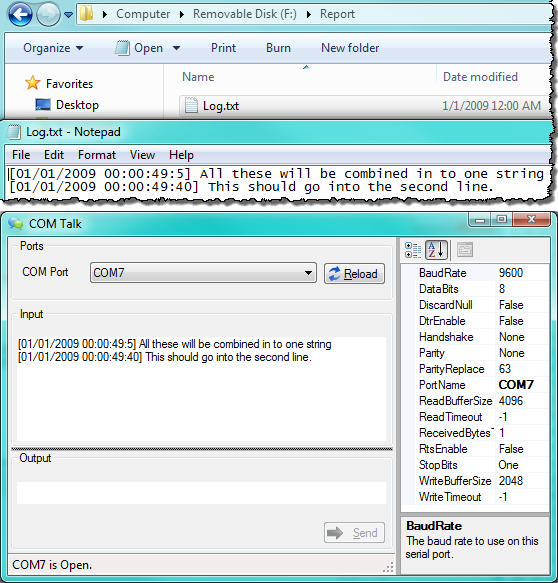 And the COM Talk standalone program was able to faithfully display the incoming data to a COM port. Here is a small video of sending data from Netduino to computer.